In the meantime, check out the facts and figures that made last May’s POWERFEST a smashing success by clicking here. partypoker is partnering with the World Series of Poker to provide exclusive online satellites to the $1 million guaranteed WSOP Brazil Main Event. Hosted in Sao Paulo that starts on 24th September. Satellites are starting this Sunday (July 30), giving players the chance to win a $1,500 package for WSOP Brazil for as little as $2.20. WSOP Brazil, sponsored by partypoker LIVE, will be running September 27 to October 4. In the spectacular Bienal pavilion in Ibirapuera Park in Sao Paulo. This will be partypoker’s first live event in the LATAM region where poker has been enjoying spectacular growth. More than eight million Brazilians already play poker, with over a million new players taking up the sport every year. Last year’s inaugural WSOP Brazil event attracted more than 12,000 players across the eight-day festival. Brazilian Francisco Moura won the $1,100 buy-in Main Event for $238,372 after beating a field of more than 1,000 players. partypoker will be running a three phase qualifier program for WSOP Brazil with online Quarter and Semi Finals phases every day. And a weekly Final each Sunday which comes with ten $1,500 WSOP Brazil seats guaranteed. The $1,500 prize package comprises the $1,100 buy in for WSOP Brazil plus $400 spending money. The Quarter and Semi Final phases on partypoker will give players of all bankrolls the chance to compete at WSOP Brazil, and the satellite program offers a great mix of regular, turbo and hyper turbo formats. Players can start their journey to Sao Paulo in any phase and carry their chips forward to the next; Quarter Finals costs $2.20 and Semi Finals are $22. Players can also buy in direct into the weekly Final. Which guarantees ten $1,500 WSOP Brazil packages and costs $215 to enter. The first WSOP Brazil Final satellite will be on Sunday August 6. Finally, among those set to compete at WSOP Brazil is partypoker Ambassador Joao Simao. The 28-year-old hails from Belo Horizonte, the state capital of Minas Gerais in Brazil. It’s one of his country’s most successful poker players. Simao has over $5.5 million in online cashes and captured the PocketFives world #1 title last year. He has also had huge success on the live circuit and has thrived at partypoker LIVE events. His total live tournament winnings of more than $850,000. Include a fifth place in the £10k partypoker MILLIONS Nottingham High Roller in April for £85,000. Also a victory in the $10k partypoker CPP High Roller last November for $88,500. partypoker LIVE President John Duthie said: “We are absolutely thrilled at the opportunity to partner the World Series of Poker for the first time. Especially in a country like Brazil where poker has such a huge and enthusiastic following. Hence, no one should miss the chance to compete here – the atmosphere at poker tournaments in Brazil is just incredible. Now is the time, today marks the launch of Stars Rewards, our revolutionary new rewards program. Stars is giving away $10,000,000 to celebrate! Finally, join now and get rewards for your real money gaming activity across all our available products, with personalised rewards you can use in the games and activities you enjoy the most! Finally, to celebrate the launch, we’re hiding cash rewards of $1,000 in over a thousand random Chests. Total in value of $10,000,000 in rewards including tickets, bonuses and StarsCoin waiting to be claimed! As a result, keep track of how many rewards your have earned with the reward tracker in the ‘My Stars’ software. 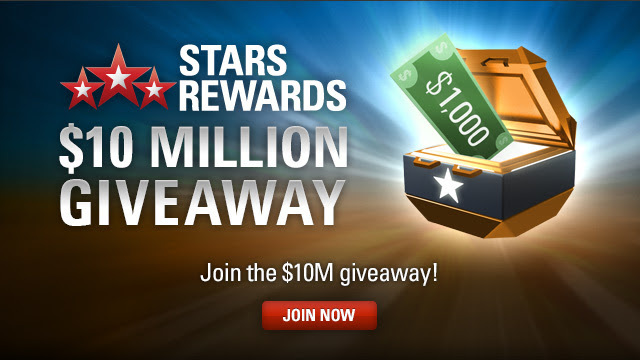 Most of all, Stars will continue to giveaway $1,000 Chests until we’ve awarded $10M worth of rewards in total. All you need to do is join Stars Rewards to be eligible! Click here for all the details, then hit the button below to sign up for free. In addition to, read the PokerStars Review on YourPokerCash. Partypoker MILLIONS Russia set to be the largest event in CIS history! With a huge $9,000,000 guaranteed festival including the $5,000,000 guaranteed Main Event, 6th- 14th September. The full schedule for partypoker MILLIONS Russia has been released with a festival guarantee of $9,000,000 from 3rd– 14th September. The live festival will be held at Sochi Casino and Resort, a multi-season mountain resort in Gorky Gorod. It’s a global entertainment complex with a unique concept in the spirit of the best casinos of Las Vegas. Sochi is Russia’s biggest and busiest summer sea resort. It attracts millions of visitors annually with its amazing mountainous coastline, endless shingle beaches, warm sunny days, and bustling nightlife. There are countless opportunities to qualify for as low as $0.01 on partypoker. Plus, $550 online Phase 1s as well as live phase 1s in Sochi. The introduction of phases is something completely new to Russia. It follows the recent success of the partypoker LIVE MILLIONS event in the UK this year. A concept that involves combining bankrolls to allow players of all levels to take a shot at big money prizepools. The first 100 players that qualify through a phase 1 will receive a special offer, refunding their the buy-in amount. There are many other ways partypoker players can qualify for Sochi including the possibility of winning tickets via Click and Collect promotions to step satellites for the $5,000,000 guaranteed Main Event. Each day players must log in to partypoker to claim one of thousands of prizes, such as a $5,300 Main Event seat, phase 1 tickets and other tickets.